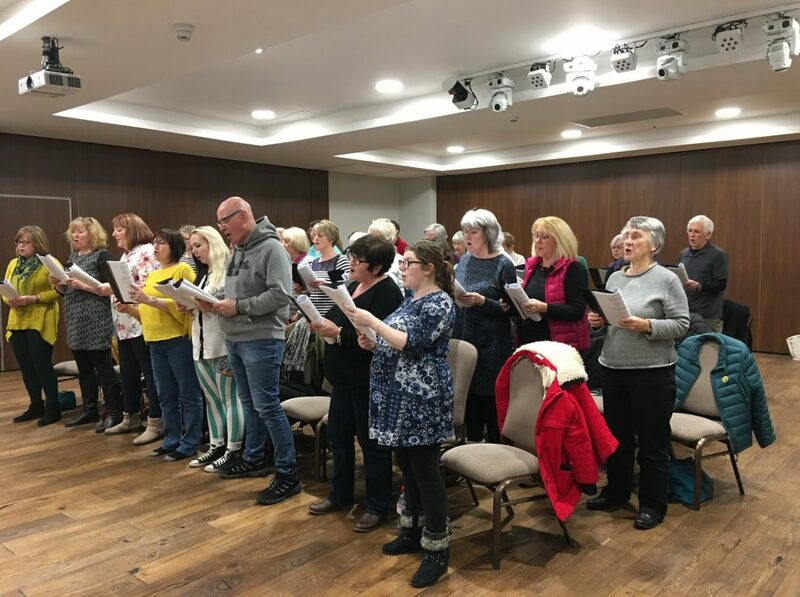 Kendal Tuneless Choir launched into song on the evening of Monday 26th February 2018. The choir is run by Ian and Tracie Penwarden-Allan. Well-known locally as musicians, teachers and conductors of Arnside Choral Society, K Shoes Male Voice Choir, OttoVoce Ladies’ Choir and The Milli Youth Choir, Tracie and Ian often meet people who won’t join a choir because they believe that they can’t sing. Ian and Tracie immediately sought to create a safe space whereby those who couldn’t sing can now sing loudly and proudly without fear of being judged! The choir meets at the fabulous new Rugby Club, Mintbridge, situated behind Morrisons on the Shap Road, LA9 6NY. We are using the upstairs room and there is a lift for those who find stairs a bit tricky. We gather every Monday evening, except for Bank Holidays, from 7.30pm to 9.00pm, with a break for tea/coffee and biscuits and the occasional cake. There is also a bar to help you lubricate your throat before heading home! It doesn’t matter when you join though it’s a good idea to sign up for emails on the form below so you’ll get updates and know if anything has changed. Newcomers will pay £10 for their first session, including registration with the choir. The regular price is £7 if you “pay as you go”, or at the start of a term you can pay in advance for all the sessions for the equivalent of £5 per session. If you have any questions you can contact us by emailing kendal@tunelesschoir.com or calling Tracie on 07799 660145. A Kendal Tuneless Choir session.